BUT… there is one constant for every organization. Every fundraiser needs a fundamental foundation of metric-based knowledge about their donor file and revenue stream. Average Gift is one of the 5 key metrics you’ll need to properly grow and steer your fundraising program. In fact, Average Gift is the most commonly tracked revenue metric. Why? Partly because it can be tied directly to how much it costs to obtain and also because it serves as a ‘cut-off’ or ‘starting point’ for upgrading donors. The amount of your Average First Gift. The Average First Gift is important because it’s always the most expensive to acquire and has a direct relationship with the future or Lifetime Value of the donor who gave that first gift. The amount of your Existing Donors’ Average Gift. Typically, existing donors have a higher average gift than first-time givers. By monitoring changes –up or down— among Existing Donors’ Average Gift, you can quickly determine how your strategies around asking amounts/formulae and upgrading strategies (monthly giving, mid-level programs) are working. From our special guide, “5 Vital Metrics to Monitor and Improve the Health of Your Fundraising Program”, this illustration shows how you calculate Average Gift metrics for your organization. There are a number of proven way to increase the size of the average gift on your file. In some cases, you can simply change your “asking formula” and by doing that raise the gift size. In other cases, you can gain significant upgrades by increasing the number of donors whom you move to higher gift programs such as a Mid-Level program. Fortunately, the transactional/giving information in your donor database contains all the ingredients needed for a winning upgrade program. That’s because DonorTrends has built a proven scoring system that predicts the potential of future donor behavior. DonorScores™ is a tool hundreds of nonprofits now use to target donors and move them up the ladder of increased giving. DonorTrends uses a 'Fundraising Football Field' to depict moves management or major donor pipeline development. 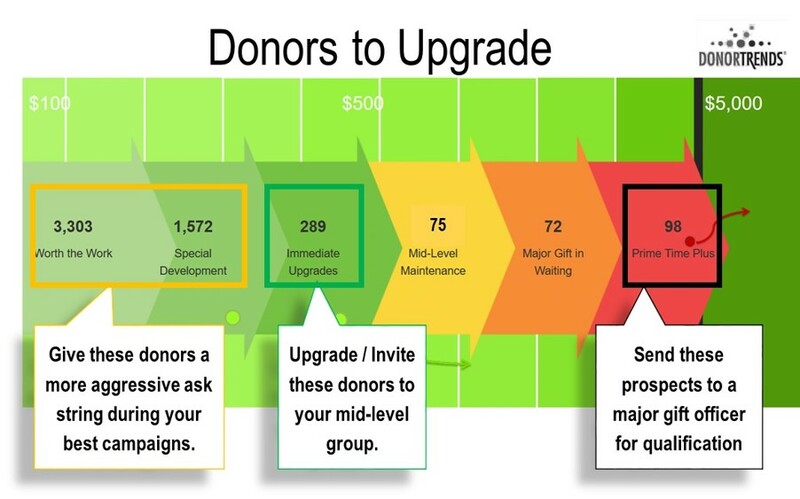 This visual helps Fundraisers understand the upgrade potential they have on their file and provides a recommended strategy for moving each cluster down the field toward the major gift goal. Here's an example. This organization defines major donors as $5,000+ and mid-level as $500 - $4,999. Donors likely to upgrade have been identified using the DonorScores predictive model scoring system. 5 groups, or donor clusters, are created Based on previous giving and their DonorScore™. In the middle of the field, there is a group of donors to target for mid-level upgrading [called Immediate Upgrades]. These donors are vital to building a strong major donor pipleline. A mix of ask and non-ask cutlivations should be targeted to these donors through a multi-channel strategy. At the end of the field, major donor prospects are identified. These high value donors warrant further qualification from major donor officers. Once qualified, they are placed in an active portfolio for a major donor ask. How Well Does Scoring Work? Quite well, based on experience with dozens and dozens of organizations. Below are results from an upgrade campaign aimed at moving donors into a mid-level program. The evidence from years of campaign results is sufficient to conclude that the use of machine learning and predictive analytics can achieve dramatic and steady increases in Average Gift. Why? Because this is a system that segments, ranks and prioritizes donors most likely—and least likely—to upgrade their gift amounts. The football field image and the corresponding recommendations by cluster makes it crystal clear what upgrade actions should be undertaken. The effective DonorScores™ predictive clustering and upgrading methodology is more fully described in this free Case Study that you can download by clicking here. 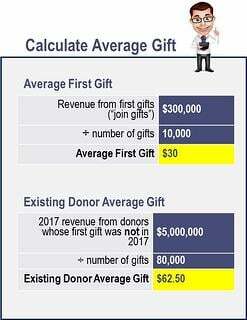 If you’d like to discuss how this proven system can work to increase your Average Gift start here by calculating your upgrade potential or email me: caity.craver@donortrends.com.